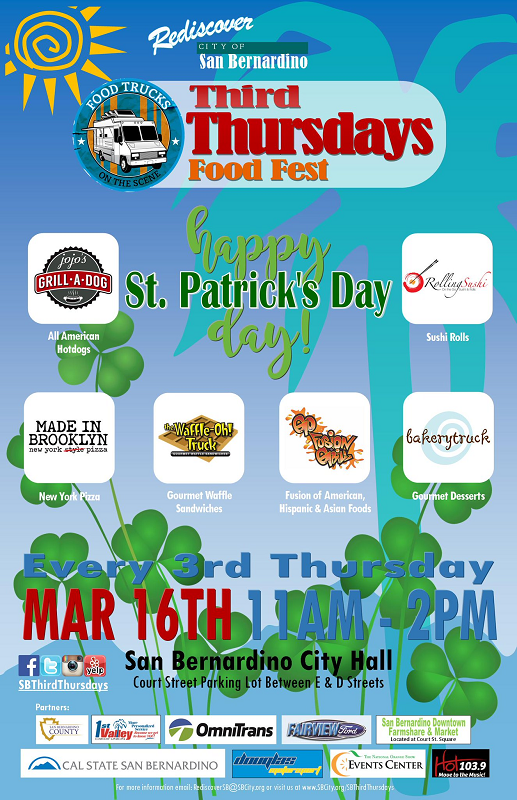 The folks at San Bernardino’s Third Thursdays Food Fest are celebrating St. Patrick’s Day a day early, and so can you. They’ve got six food trucks lined up for tomorrow’s (March 16) event, which takes place from 11 a.m. to 2 p.m. in the City Hall parking lot on the south side of Court Street, between D and E streets in downtown San Bernardino. This month’s scheduled trucks include: The Bakery Truck, Go Fusion N Grill, Jojo’s Grill-A-Dog, Made in Brooklyn, Rolling Sushi Van and the Waffle-Oh! Truck. For updates, “Like” ’em on Facebook, or follow on Twitter and Instagram.